Equally capable of crossing continents or taking on a track day, the Sprint is one of those rare contradictions, a compromise without compromise. Triumph’s addictive 1050cc triple has been tuned to deliver 127PS, with seamless drive from low rpm. 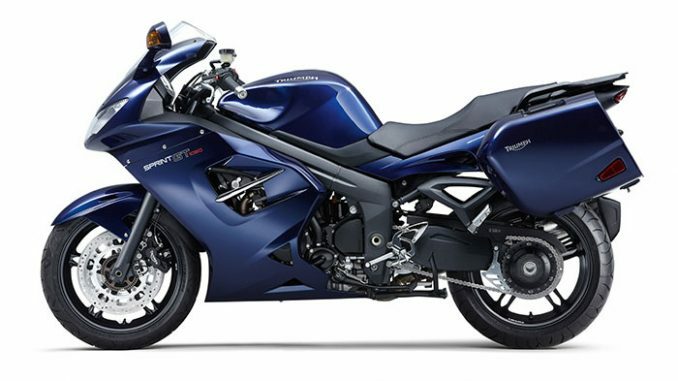 Striking details like the single-sided swingarm and aerodynamic three headlight cockpit give the Sprint its distinctive sporting look. Sprint GT. All round entertainment.With emphasis on the ‘touring’ aspect of ‘sports touring’, the Sprint GT lives up to its ‘Grand Tourer’ tag while keeping its edge. It offers a unique proposition of performance, practicality and price. 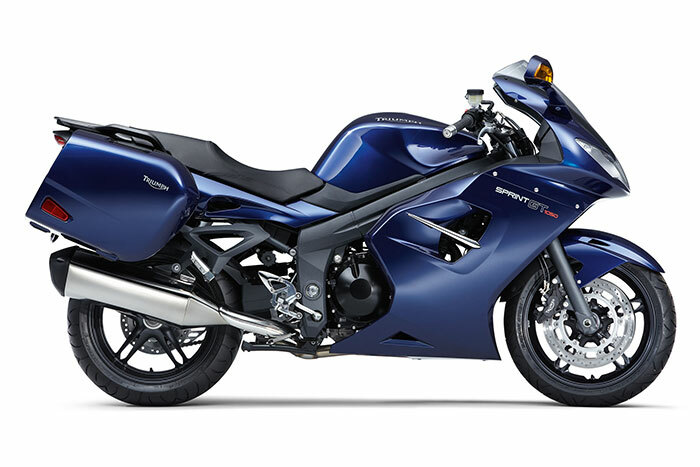 Performance from the uprated 1050cc triple with 130PS on hand. Practicality – the GT’s byword – with 117 litres of luggage, ABS brakes, underseat u-lock storage space, built in rack and grab handle, and a 200 mile fuel range. Price? No one comes close. Sprint GT. For all the roads ahead. 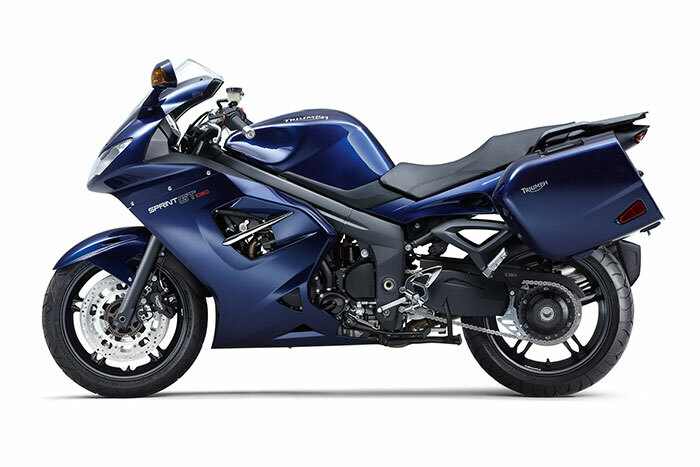 Performance: Triumph’s 1050cc triple engine uprated and good for 130PS, 108Nm of torque for greater everyday performance. The new ECU helps deliver smoother throttle response, more power and torque and improved fuel consumption. Handling and Comfort: With the same twin-spar aluminium beam frame as the ST, plus uprated internals and a new chassis, the new Sprint GT combines Sports bike performance with two up all day touring comfort. Practicality: Underseat storage with space for a u-lock. Built in rack and grab handle. 200 mile fuel range. World class luggage handling with 31 litre helmet-swallowing panniers as standard. The Sprint GT is as practical as you need. Even More Practicality: Triumph’s Accessories division offers a full range of accessories for you to create your own GT. Start with a colour coded and powered top box. 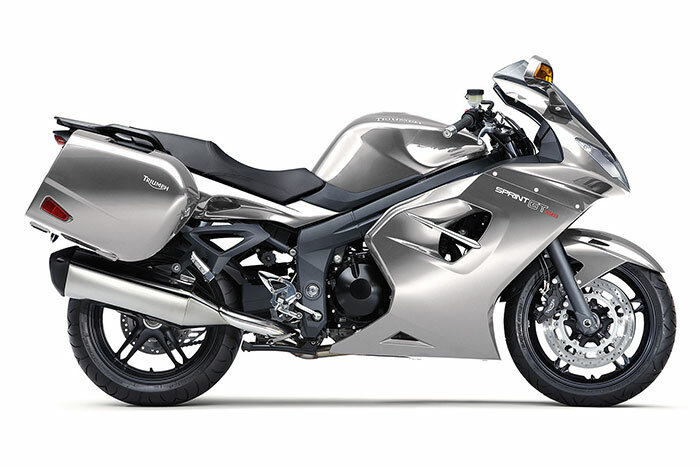 Check out the seating options, heated grips and taller aero screen. Designed by long-distance riders for long-distance riders. That’s why the GT has the 1050cc triple renowned for power, reliability and soul. That’s why the GT has a fuel tank that’ll cover 200 miles. That’s why the GT has an uprated headlight an extended swing arm for better stability and that’s why the GT has up to 117 litres of luggage capacity with an accessory top box including 12v electronics. Triumph’s 1050cc triple engine uprated and good for 130PS as well as 108Nm of torque. The new ECU helps deliver smoother throttle response, more power and torque and improved fuel consumption. A 200 mile fuel range for more time between stops. More horsepower. More everyday performance. The main twin-spar aluminium beam frame carried over from the revered ST whilst the 43mm front forks have uprated internals for improved control and damping. Lighter wheels shod with ZR17 120/70 (front) and 180/55 (rear) tyres for grip and durability. Longer single swing arm for better stability and uprated suspension with remote pre-load adjuster wheel which can be changed by hand. High performance headlights complement a new cockpit designed with the rider in mind. Sharper looks. Better mirrors. The GT’s rear end and exhaust system enables huge improvements to storage and practicality. 31 litre capacity helmet-swallowing, colour matched side panniers for those long trips. Underseat storage and optional powered colour coded topbox for ‘on-the-go’ charging of electrical items like phones and laptops.